Let’s start with a little bit about your background. I graduated from the University of Florida with my Bachelor's in Health Science in 2011 and my Doctorate in Physical Therapy in 2014. Prior to going to PT school, I trained as a competitive dancer and singer for 15 years. 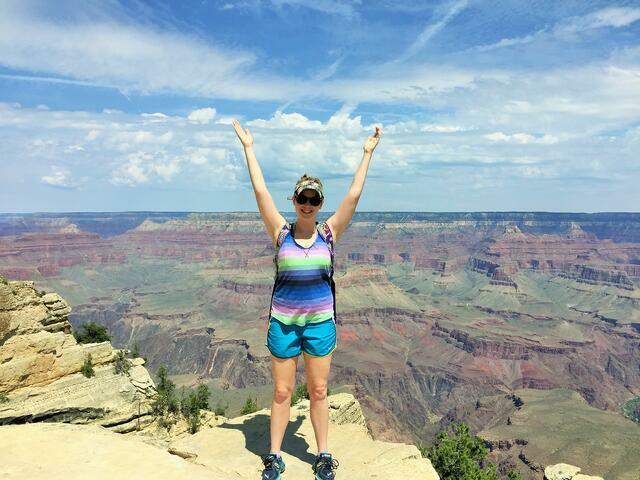 What made you decide to become a touring physical therapist? For me, the opportunity to specialize in performing arts physical therapy and tour with Broadway shows is the ultimate dream job. It is the combination of many of my passions: dancing, singing, physical therapy and travel. So when the opportunity arose to work in this niche field immediately after graduating from PT school, I took it. Tell me about your history with NEURO TOUR. It has been almost three years since I made the decision to trade the comforts of my own home and traditional PT clinic for tour life. In that time, I have worked with approximately 10 different shows, including Newsies, Cinderella, Dirty Dancing, Beauty and the Beast, Elf: The Musical, and Phantom of the Opera. 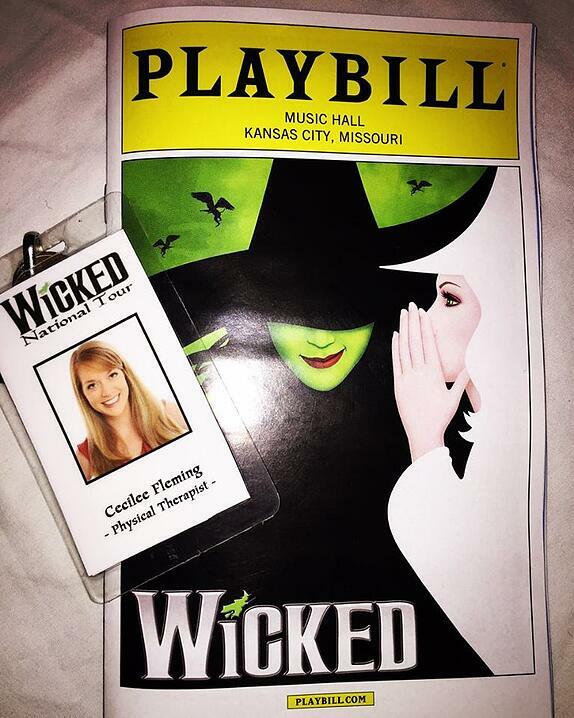 I am currently touring the country as the full-time physical therapist for the national tour of Wicked: The Musical. Describe your typical day on tour. My usual work schedule is 5:30 p.m. – 10:15 p.m. Tuesday through Friday, 12 p.m. – 10:45 p.m. on Saturdays, an 11:00 a.m. – 9:15 p.m. on Sundays. I start work two hours prior to every show, seeing patients one-on-one every 30 minutes until the show starts. Then I have appointments during the show for individuals that are either not performing that night or have breaks between scenes. I am also present during the shows to triage injuries on the side of the stage and accompany company members to the ER or urgent care when warranted. I will also attend show-related physician appointments with them during the day to help with the continuity of care. Predominantly working evenings allows me to have most of my mornings free to explore what each city has to offer. What are some common injuries or conditions that you treat on tour? Common injuries vary greatly depending on what the demands of each show are. 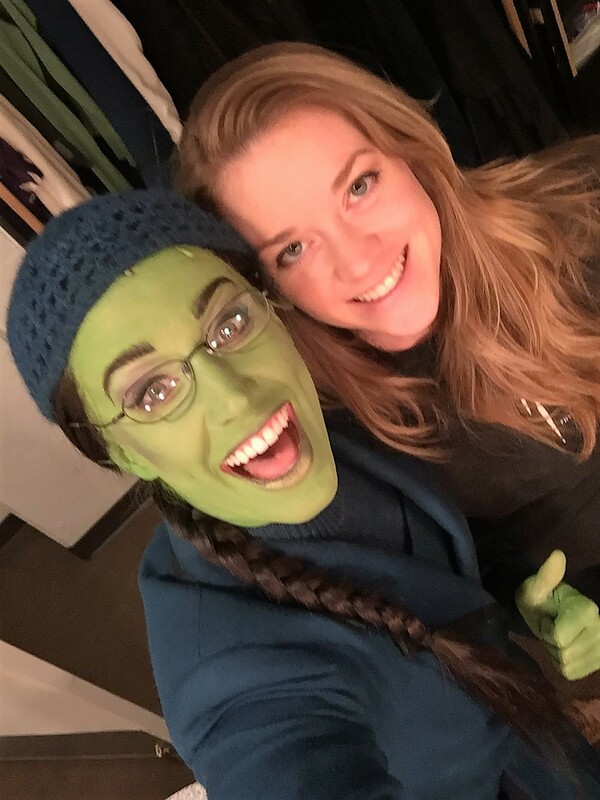 On Wicked, I see a lot of performers for neck pain related to wearing asymmetrical wigs, heavy costumes, and choreography that requires rapid, sharp head movements. On Dirty Dancing, I often saw the male ensemble members for shoulder injuries from lifting their partners overhead upwards of 15 times a show and the female ensemble members for back pain from repetitive back bends. I also find that the injuries vary based on the individual tracks. For example, the Chistery track in Wicked is more likely to have shoulder and lower extremity issues from performing as a monkey while the Nessarose track is more likely to have neck issues from manipulating a wooden wheelchair and always looking up. Overall, strains, sprains and tendinopathies are the most common injuries due to the wear and tear from performing a physically challenging show 8 times a week. What are some pros of being a touring physical therapist? Wanderlust! If you have a thirst for travel, touring is the perfect fit! Touring has enabled me to travel to over 50 cities and explore what each one has to offer. I have hiked in the Grand Canyon, explored history in Philadelphia, visited Niagara Falls, been to the top of the Space Needle, met an astronaut at NASA, hiked waterfalls in Oregon, trekked through the Redwoods in Muir Woods, visited monuments in D.C, watched whales off of the California coast, partied in Vegas, and created more memories and adventures than I could ever list. Traveling has also allowed me to meet new people, visit old friends, and network with fellow professionals in a way that I would never be able to do by staying in one place. The number one priority for me when I graduated was finding a job that provided me mentorship. 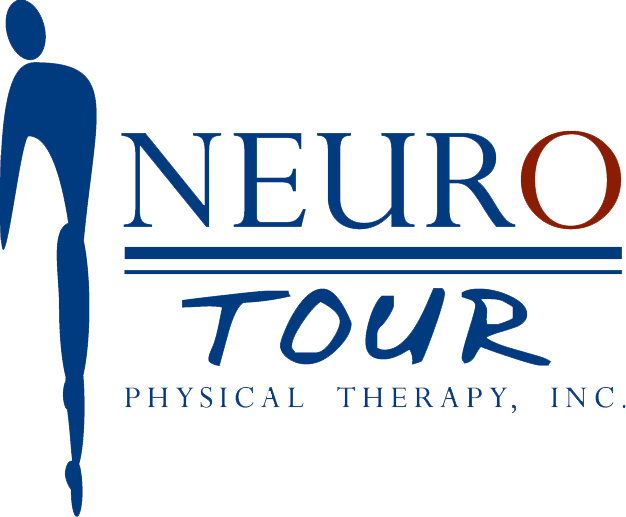 Every NEURO TOUR physical therapist is required to complete a touring fellowship where you spend the majority of each day learning new skills and treatment paradigms with an experienced PT, then in the afternoons you work at one of the local clinics or on a production in town. The skills I gained in the fellowship would have taken me years to acquire via CEU courses. While in my fellowship, I was given the opportunity to fly to touring productions with my bosses, where we treated and provided injury prevention seminars. The fellowship program gave me the chance to get my feet wet before starting out on my own tour. Most PTs can only dream of seeing patients 1:1 in a healthcare environment with dwindling reimbursement rates, but touring allows you to do just that. I love that I am able to focus on the needs of one person at a time. The magnitude of talent in touring Broadway productions is astounding. The casts and crews that I work with are the best in the business and push themselves to the limits each and every day and they rely on me to help them keep going. Plus, I get to listen to and watch a Broadway show every night! Whether it’s moving every couple of weeks (or days depending on the tour), exploring a new city, or being called to the stage to assess an injury during a show, my life is anything but boring. I love the variety that touring gives me! Being the only medical professional on staff comes with a lot of responsibilities. The biggest being that I do not have anyone else on tour with me to bounce ideas off of or learn from once on the road. On the positive side, this pushes me to stay self-motivated, keep up-to-date with new research, and to be a critical thinker. And I can always reach out to my fellowship mentor if I need a second opinion. I am very close with my family, so being away for long periods of time is challenging. I am typically limited to 36-hour visits when the tour is changing cities. However, some tours do have built-in breaks which make visiting friends and family a bit more feasible. Scheduling time off for events, CEU courses, or vacation takes a lot of planning. Time off is limited as it requires that another PT be available to fly out to whatever city the tour is in to cover for me. Sometimes this means missing out on big events. However, NEURO TOUR management always works with me to accomodate my time off requests. Moving cities so often can make it difficult for patients to establish a primary care physician or find an orthopedist. This makes getting perscriptions and check-ups a bit more challenging. I tend to reach out to fellow tour PTs or connections I have developed along the way to find the best practitioners in each city. Moving every couple of weeks (or days) means a lot of packing and unpacking in each new city which can become monotonous. However, the majority of tours limit you to two 50-pound suitcases so I have learned how to pare down to the essentials. Luckily for me, Wicked also provides a personal trunk that they travel for me. I use mine as a portable kitchen so that I can still make healthy food when my hotel does not have a kitchen. What would you say to someone who is interested in becoming a touring physical therapist? 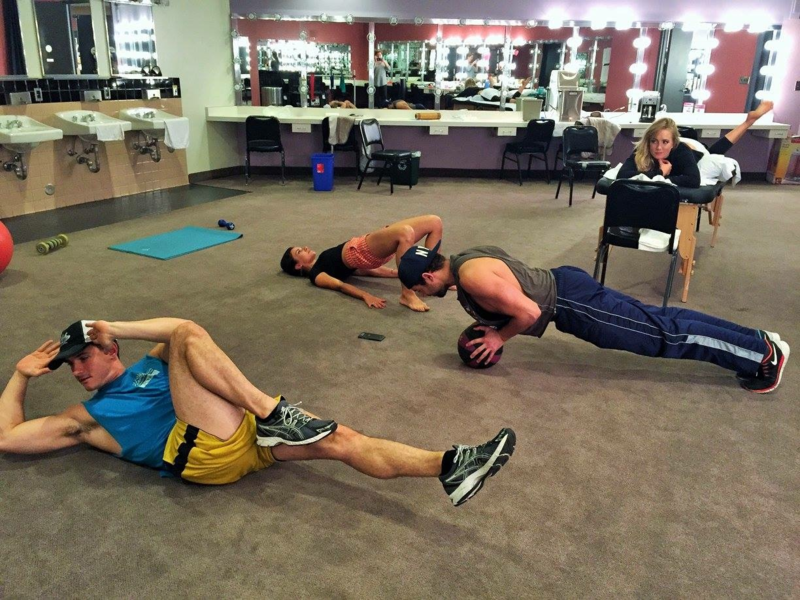 I have loved every moment of being a Touring PT as the pros far exceed the cons for me. If you have a taste for adventure, are interested in working in Performing Arts, and don’t have other responsibilities tying you to one place, I recommend taking the jump.